For the birder, roads are an ironic boon. Whether made of asphalt, gravel, or dirt, they help us reach more birding sites in less time. In many places, roads bring us to ever distant nature but the downside is that roads also give access to people who would rather replace forests, wetlands, and grasslands with unsustainable housing and agriculture. As in many parts of the present world, the best accessible habitat is usually at the end of a distant road. Thanks to fortunate foresight, a lot of land was set aside in Costa Rica as national parks and protected areas (and some of these are easily accessed) but the best forest still happens to be at the terminus of the road and en route, you will be treated to species deficit birding in plenty of pastures. Driving through pasture in the Osa Peninsula. In Costa Rica, one of the best “end of the road” places for birding and getting crazy with biodiversity is the Osa Peninsula. This foot-shaped piece of land in southern Costa Rica is just about as far from San Jose as you can go without leaving the country. 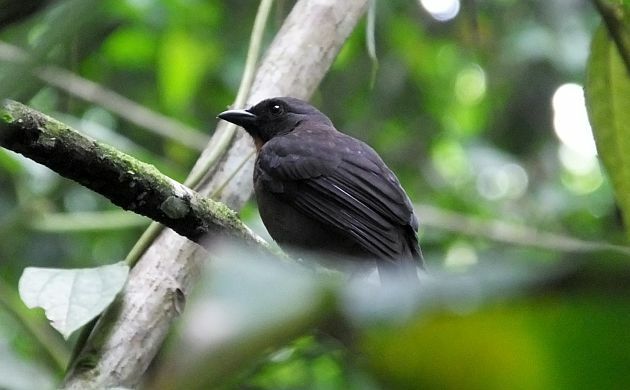 This special place is also one of the last bastions of wild rainforest on the Pacific coast of Central America, hosts many endemic plants and animals, and as one may surmise, is pretty awesome for birds. A piece about the Osa in National Geographic hinted at the fantastic birding and biodiversity by referring to it as “the most biologically intense place on Earth”. 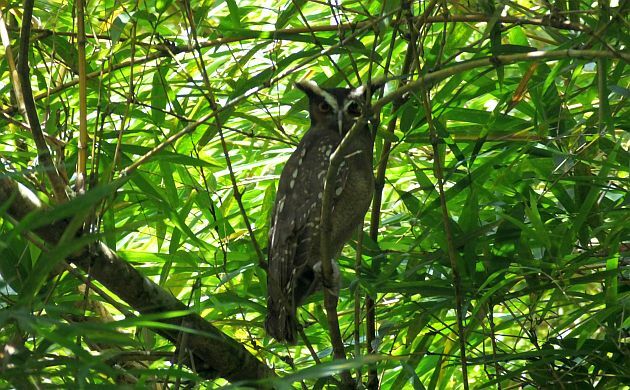 Having spent a fair amount of time in the Osa, I can attest to the birding being as exciting as it sounds but accessing the wild rainforests of the Osa in comfort can be a bit of a challenge. 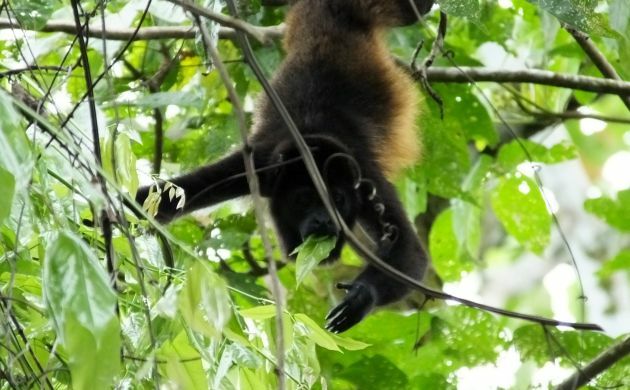 Corcovado National Park protects at least a third of the land in the Osa BUT there are few access points, you can only enter the park with a certified guide, and the sole possibility for accommodation is in bunks or camping that must be reserved in advance. Not to mention, Sirena station is only accessible by a plane ride, or a 17 kilometer infamous beach march that involves wading across a river or two where crocodiles and Bull Sharks wait at the mouth (this is no exaggeration). Fortunately, there are several lodges in the Osa where access is a lovely piece of cake, including a few that cater to birders (the Bosque del Rio Tigre stands out). That said, very few are near the borders of the park itself. One of those few is Luna Lodge. This eco-lodge and rainforest yoga destination is truly at the end of the road. 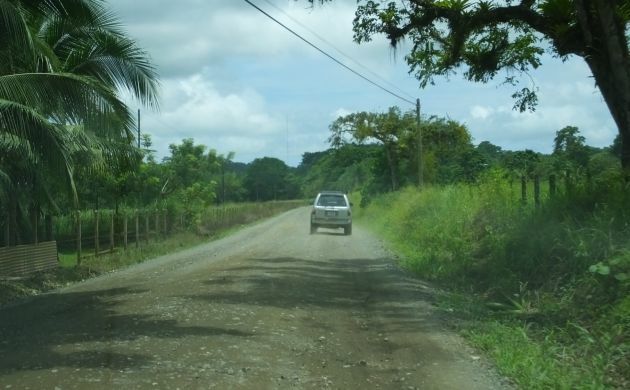 If you don’t fly to the tiny yet scenic airstrip at Carate, you have to drive to Puerto Jimenez (now made easy courtesy of asphalt) and continue on for one and half to two hours on a bumpy gravel road with several river crossings. Although there aren’t any crocs or sharks, during the rainy season, you may have to contend with being washed away. After reaching the supposed settlement of Carate (I think I saw a house), it’s time to drive up a river. In a few spots, this is a literal endeavor but when you finally reach Luna Lodge, get ready for exciting birding, comfortable rooms, and amazing food, all in the heart of the wild Osa. Lots of monkeys there too. The lodge is surrounded by rainforests that are part of the Osa forest block and the border of the national park is just a few kilometers to the west. As befits an end of the road destination, Luna Lodge is true wilderness birding. In Central America, that translates to King Vultures, flocks of Scarlet Macaws, exciting mixed flocks, lots of uncommon forest birds, daily monkeys, and trails with the tracks of Puma, tapir, and Jaguar. Those two creme a la creme neotropical king raptors, Crested and Harpy Eagles, have also been seen at Luna Lodge although not for some years. The two king eagles might still be somewhere in the Osa but I didn’t hit that avian jackpot while guiding a Birding Club of Costa Rica trip a couple weeks ago. Nevertheless, as expected, the birding was damn great. Turquoise Cotinga is the star of the birding show at Luna and everyone had multiple males and females of this beauty from both the birding platform, and right at the lodge. 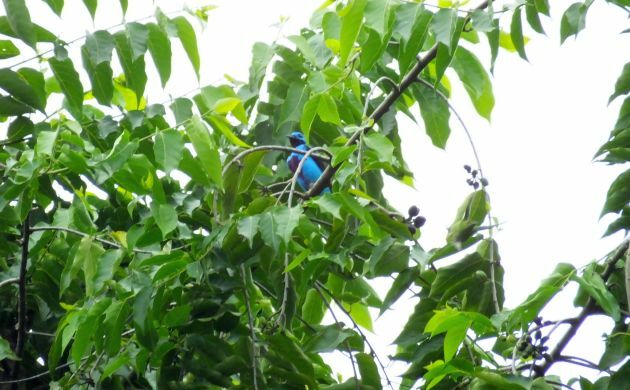 A not so close look at a male Turquoise Cotinga. When the cotingas were elsewhere, we had fun with point blank views of gorgeous Shining Honeycreepers, Riverside Wren, Black-hooded Antshrike, Charming Hummingbird, Golden-naped Woodpecker, and dozens of other species. 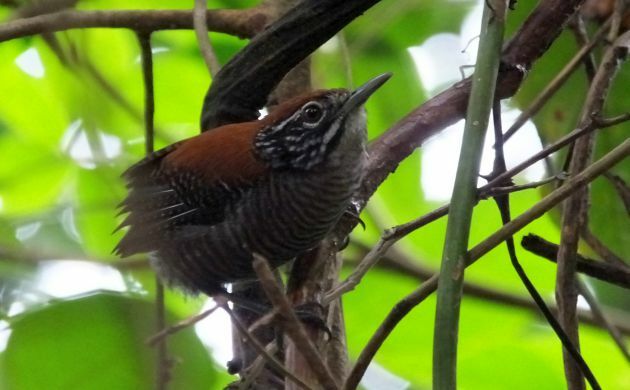 Riverside Wrens are nearly endemic to Costa Rica. 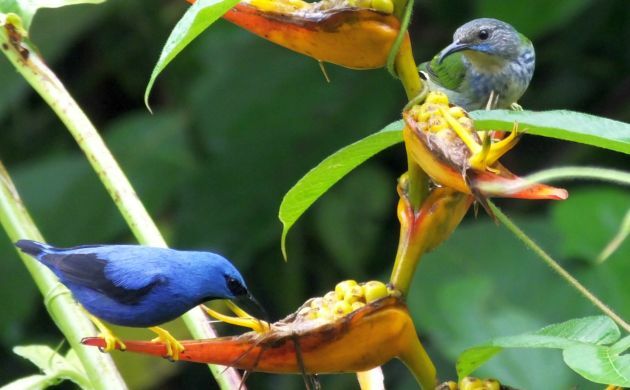 A pair of Shining Honeycreepers. On the trails, mixed flocks entertained with several woodcreepers, White-throated Shrike-Tanager, Plain Xenops, Buff-throated Foliage-Gleaner, and excellent looks at another avian Osa rock star, the endemic Black-cheeked Ant-Tanager. 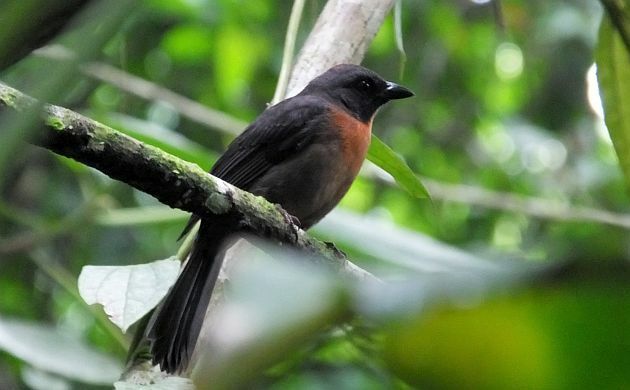 The Black-cheeked Ant-Tanager only lives in the Osa and a few adjacent sites. Up in the beautiful primary rainforests of the Ridge Trail, the forest resounded with the calls of Rufous Piha as we watched Scaly-throated Leaftosser, Red-capped and Blue-crowned Manakins, and Marbled Wood-Quail. Luna’s local excellent guide, Gary, also brought us to a spot near the lodge for looks at Streak-chested Antpitta, Tawny-winged Woodcreeper, Bicolored Antbird, Black-faced Antthrush, and other rainforest species. There is a fair chance that the Buff-throated Foliage-Gleaners in the Osa and the Pacific slope of Costa Rica are a cryptic species. I think we had 170 species total and that doesn’t include open country birds seen on the way to the lodge like Hook-billed and Pearl Kites, and, for one lucky car, a look at a Savannah Hawk (this last one, an extremely rare vagrant in Costa Rica). We didn’t see the hawk but did get lucky with a Crested Owl. Despite all of the exciting birding, we left Luna Lodge realizing that no matter how far the end of the road rainforests might be, they can still be threatened by absolute greed. On our final night at this sustainable, non-impact lodge, Luna Lodge’s owner, Lana Wedmore, gave a presentation about threats to the rainforests between the lodge and the national park. Incredibly, one or more developers want to “develop” those forested ridges by devastating them with condominiums and luxury housing. To counter the threat, Lana started the “White Hawk Project” to raise funds for the purchase of those properties so they can be protected as a private reserve. The night before we left, she told me that she was excited because they were close to buying some of the first properties. I hope that my next trip to Luna Lodge will be accompanied by news that the purchases for the final properties have been made because I never want the end of the road in the Osa to lead to a deforested, “luxury development”. Amazing birds and we hope the properties can be purchased and make a private reserve. Week 19: Out of Africa!